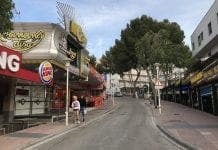 MAGALUF tourist rental accommodation searches have doubled in the first six months of 2017, according to new year-on-year data. Holiday search engine Hundredrooms.com also reported that the average price of a summer break in the Mallorca resort has almost doubled compared to March’s rates. The average price for accommodation for eight guests in July is €931 per night, or €13,056 for a 15-day stay, according to Hundredrooms’ analysis. May saw a 20% increase in bookings at the popular party resort, according to the website’s data analysis. Occupation levels in the first two weeks of June were up to 73%, the website revealed.